Well known culinary herb, used especially for flavouring lamb. 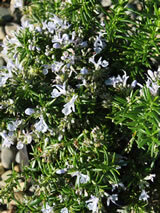 This form is a semi prostrate shrub, aromatic narrow leaves, green above, and white below. Late winter and spring the shrub is covered with mid blue flowers, which bees love. 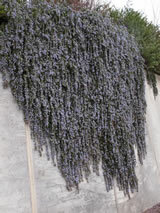 Trim after flowering to maintain shape and fresh growth. Suits dry sunny conditions, avoid wet ground. Useful ground cover.